I use store-bought crusts (comes 2 in a box) and I roll out one to fit a 9-inch pie plate. I roll it thinner that the average crust so I will have scraps with which to make decorative leaves on the top. Pre-heat oven to 425 degrees. Make bottom crust, prick, and bake 5 minutes. Meanwhile make strips or decorative leaves with remaining pieces and set aside. Save the second crust, it will keep indefinitely if refrigerated. Combine raisins and water. Boil 5 minutes. Blend sugar, cornstarch, cinnamon and salt in a small bowl. Add to raisin mixture and cook about 1 minute, stirring until clear. Remove from heat, stir in vinegar or lemon juice and butter. Cool slightly. 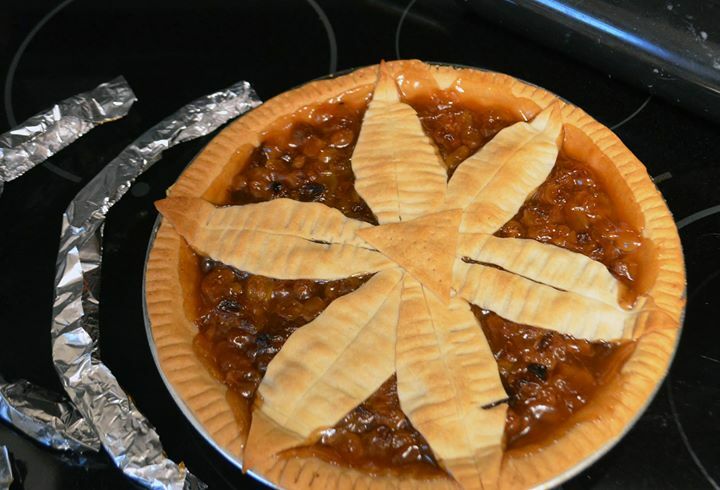 Pour into pie shell and decorate with pastry leaves. Bake at 425 degrees for 30 minutes or until golden brown. Note: For a truly old-fashioned raisin pie, make this with dark raisins and and add a top crust (if you do this, don’t pre-bake the bottom crust).